At the beginning of 1917, the Russian city of St. Petersburg was known as Petrograd. World War I was still raging, and the war-weary people of the city were hungry. People protested the lack of food. When they believed that bread was being deliberately withheld from them, the situation worsened dramatically. 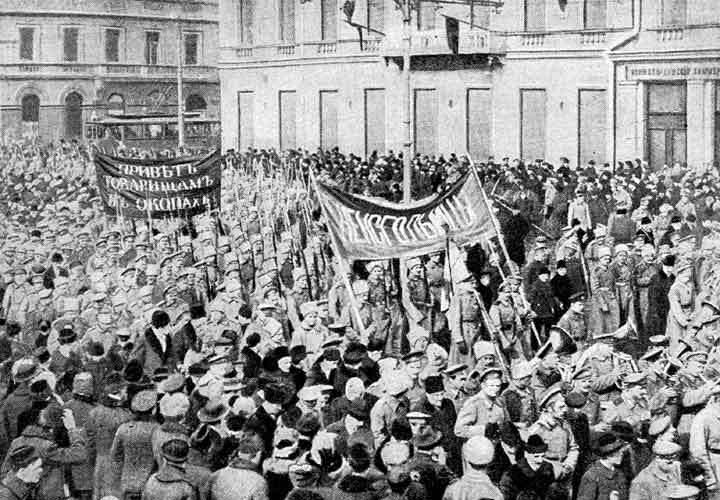 On the 8th of March, 1917 - referenced in Russia, at the time, as February 23 since the country was then still on the Julian ("Old School") calendar instead of the Gregorian ("New School") calendar - spontaneous, unorganized uprisings broke-out in Petrograd (St Petersburg). More than 100,000 people went on strike. First demanding food, the demonstrators soon expanded their protests, demanding that Tsar Nicholas II - who was with his troops, fighting the war - must relinquish power. Not a politically effective leader, and advised by out-of-touch personnel, the Tsar could not stop the protests. He thought that if his soldiers used force against the striking demonstrators - and fired their weapons at them - the people would disperse, and the demonstrations would end. Miscalculating the situation, and his options, the Tsar remained out-of-touch with his people. His actions, and orders, made things worse. Even some of the soldiers joined the protestors. The protests against the Tsar and his imperial government were so effective that Nicholas II was forced to abdicate (after the Romanov family had ruled Russia for three hundred years). Because the protestors did not have clear leaders for themselves - and no ready replacements to head the government - Russia was thrown into unrest and disorder. Vladimir Lenin, who took power in a second revolution later in the year, was still in exile during February and March of 1917. This clip, from a story about the beginnings of the Russian Revolution, includes primary-source references, interviews with experts and recreated scenes. From Russian Revolution: Freedom and Hope, a BBC documentary. Copyright, BBC, all rights reserved. Clip provided here as fair use for educational purposes and to acquaint new viewers with the program. Bos, Carole "Beginnings of Revolution in Russia" AwesomeStories.com. Oct 07, 2013. Apr 19, 2019.